Fun facts! To most of you, Tenerife is a holiday destination, or a place to which you've emigrated, that has brilliant weather, cheap cost of living, loads of entertainment and things to do and a profusion of beaches and other holiday paraphernalia. But there's more to this island and sometimes it may surprise you. I've compiled as many facts about the island as I can think of, for your amusement. Keep your eye on this page, as I'll keep trying to update and add to it. The Tenerife flag: why is it the same as Scotland's? The Nelson arm mystery: did it end up in Gran Canaria? The Dragon Tree: what is it and why is it there? Was Tenerife Atlantis? You decide. Will Teide erupt? We're about due! San Borondon - the eighth Canary Island? A Tenerife village called "The Overcoats"? What's all that about? The myth of the Garden of the Hesperides. It's not boring, promise. The Elysian Fields - Was Tenerife the resting place of Ancient Greek heroes? The Spanish "Lisp" How did it originate and why don't they use it in Tenerife? The Dark Ocean - The reason why Tenerife was left alone till the Spanish Conquest. Agatha Christie In Tenerife - The famous mystery writer spent some time on the island, where she wrote some of her stories. Elizabeth Taylor and Las Veronicas - Were the two connected? Astronomical Fun Fact: There is a mountain range on the Moon called 'Mounts Tenerife', because it was first observed by an astronomer whilst at the summit of Mount Teide. The little badge you see on the bumpers of taxis that says "SP" doesn't indicate "Spain", as most people (including me) assumed. It stands for "servicio publico". The beer "Dorada" (pronounced "do-RAH-dah", not "doraydo"), is a beer native to Tenerife and is brewed exclusively on the island. Apart from a small presence on neighbouring island Gran Canaria, it cannot be found anywhere else in the world. 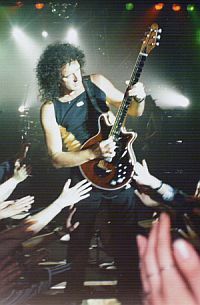 In 1971, the Queen guitarist with a degree in astronomy, Brian May, was visiting the Observatorio del Teide at Izana as part of his thesis. Whilst there, he wrote the hit song "Tie Your Mother Down". Tom Cruise once set foot on Tenerife, totally unannounced. Word has it, he was cruising the area (quite appropriately) in his yacht, sometime in the 1990s, stopped off at Tenerife, went to a shop and bought a roll of film. The shop in question was at the end of the strip underneath the Paloma Beach complex (next to where Rumours restaurant used to be). They took a photo of him and pinned it up on their door. I was living at Paloma Beach at the time and missed it! The shop, unfortunately, is now a bar. In the 16th century, the Canaries were overrun with pirates far more than the Caribbean. Instead of the fictional "Captain Jack Sparrow", there was the real life Captain John Hawkins. Even the legendary eighth Canary Island, San Borondon was brought into the picture, with the pirates claiming that that was where they hid their ships. This was directly reflected in the "Isla de Muerte", featured in the "Pirates of the Caribbean" films. One in six people on the island of Tenerife is involved in the tourist industry. In the U.S. state of Louisiana, just east of New Orleans, there is a large community of people descended from Canary Island inhabitants. It is called St. Bernard Parish and its members continue to speak the Canarian dialect of Spanish. The Canarian word for "potato" is "papa". Elsewhere in the Spanish speaking world, "potato" is "patata", whereas "papa" means "Pope"! So, when you're tucking into your carne con papas, you'll be eating MEAT WITH POPES! Santa Cruz is not only the capital of Tenerife. It is, jointly with Las Palmas, the capital of the Canary Islands. credit The Torres de Santa Cruz [Towers of Santa Cruz] are the tallest buildings in the Canary Islands and the tallest residential buildings in the whole of Spain. 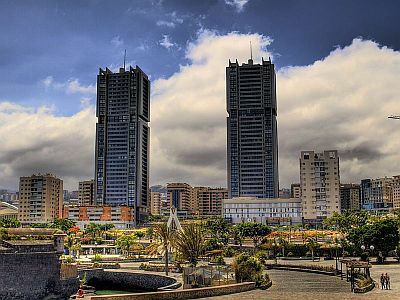 The Torres de Santa Cruz [Towers of Santa Cruz] are the tallest buildings in the Canary Islands and the tallest residential buildings in the whole of Spain. That scourge of Tenerife, the cockroach, can live on for two weeks if its head is cut off. It only eventually dies because, without a head, it can't eat. Tenacious little beggars, aren't they? Mount Teide is the third largest island volcano in the world. I believe the top of the list is Mauna Loa on Hawaii. If anyone knows the second largest, please let me know. The village of Vilaflor is almost the highest in Spain, at 3800 feet. The village that holds the title is Trevelez, on the mainland, in a valley of the Sierra Nevada mountains, at almost 5000 feet. The municipality of Vilaflor, however, is the highest administrative region in Spain. So there. The maze of underground passages beneath Icod de los Vinos, covering over 10 miles, forms one of the longest volcanic tunnels in the world. There seems to be a fireworks display every two minutes in Tenerife. This is taken to the extreme every May 3rd, in the village of Los Realejos. Two streets compete for the best display. Each street uses a rival firework manufacturer and the display ends up lasting over three hours and burns about 6000 kilos of explosives! They don't mess about, do they? The ancient Tenerife people, the Guanches, worshipped the god Achamán. His chief adversary was Guayota, king of the evil genies and they believed that he lived inside the Teide volcano, which was the gateway to hell. Guayota was represented in their mythology as a huge, black dog. At 2 kilometers, the beach at El Médano is the longest in Tenerife. In Tenerife and the rest of Spain, they consider Tuesday the 13th to be unlucky, not Friday. The national anthem of Spain (and, therefore, Tenerife) is the only one in the world that doesn't have any words. It is always played as an instrumental. The orchid garden Sitio Litre, in Puerto de la Cruz, boasts the first lawn ever laid in Tenerife. Canary wine, a sweet, white variety of Malmsey, was imported to the UK back in Shakespeare's time and he refers to it in two of his plays: Twelfth Night and The Merry Wives Of Windsor. It is said that, as he himself was so fond of this drink, he received a barrel of the stuff as part of his salary. Let's hope he didn't try any of his writing while he was...under the influence! In Spain (and, therefore, Tenerife) there were no speed limits on the roads until 1974. It is asserted by some that the Teide National Park is the second most visited park in the world. The first is Mount Fuji in Japan. The elusive 500 euro note has, in Spain, been nicknamed the "bin Laden", because, like this gentleman, everyone knows what it looks like, but no-one's ever seen it. This is a scientific fact: In Tenerife, cats do not respond to the universally accepted method of attracting their attention - the "ch-ch-ch-ch" sound. No, they will only look if you go "pss-pss-pss-pss". It's true - check it out. Native Canarians never completely finish their drinks. If they have a beer, they always leave about half an inch of it in their glass. No-one knows why. Mount Teide casts the biggest sea shadow in the world. The Spanish slang word for the euro is "pavo", which actually means "turkey". Tenerife is a "sister community" of Miami-Dade County, right on the southern tip of Florida, USA, though I doubt any inhabitants of the island are aware of it.